To make the teriyaki sauce, combine the sugar, soy sauce, mirin and sake in a small bowl. Cut the chicken into small bite-sized pieces, and sprinkle with 1/4 teaspoon of salt. Heat a non-stick frying pan over medium high heat until hot. If you are using skinless chicken, you'll need to add some oil, otherwise, add the chicken onto the dry pan in a single layer. Let the chicken fry undisturbed until browned on one side. Flip the chicken over, and brown the other side. Give the teriyaki sauce a stir, and add it to the pan. Let this mixture boil, tossing the chicken in it until there's very little liquid remaining and the sauce forms a thick shiny glaze. Prepare 2 bowls of rice, and heat the peas in some boiling salted water. 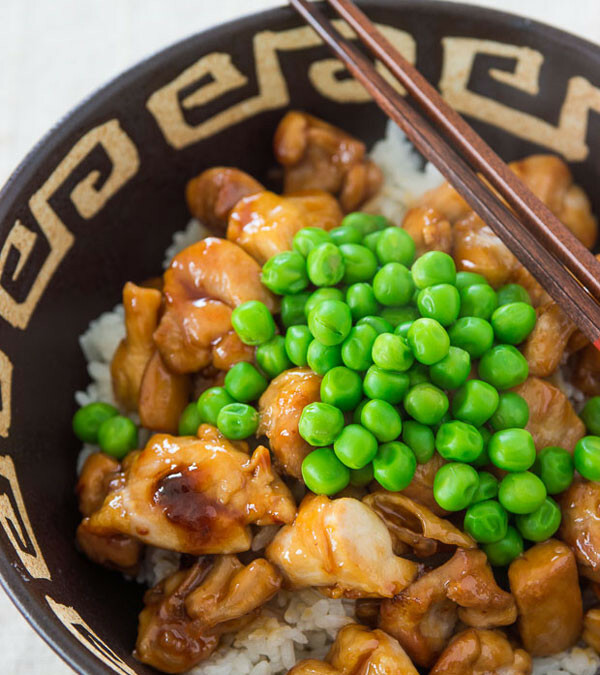 When the chicken teriyaki is done, serve it on the rice, and drizzle with any remaining sauce. Top with the green peas.